Look ma, I’m on TV! Billy Lynn’s Long Halftime Walk covers very little ground. 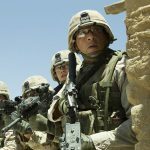 In juxtaposing the experience of the Iraq War with perceptions of it back home and the commodification of heroic soldiers, the film becomes what it’s attempting to call out. It’s an empty, impassive, short-sighted view of the complexities of war and how it affects combatants and their reactions to populist opinion. Any audacity is limited to the technical experimentations by director Ang Lee, who shot with a frame rate of 120 frames per second, and at 4K resolution in 3D. 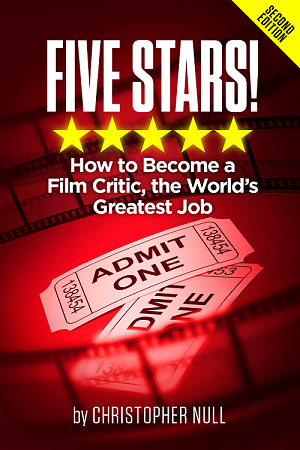 Unfortunately, there are only six theaters in the world, two in the U.S., equipped to project the film in all its hyper-realistic glory. For this reviewer, Billy Lynn was screened in a regular old theater, so there will be no comment on how the pioneering process adds to the experience, though it’s unlikely any kind of advanced visuals would be able to fully compensate for the lack of thought-provoking opinions, insightful sentiment, and expressive characters. One of the bright spots is newcomer Joe Alwyn as Billy Lynn, a young Texan whose heroic act in Iraq is captured on video and goes viral. Alwyn uses his aw-shucks smile, crystal blue eyes, and passive mannerisms to hint at a soul buried under the pretense of his character and the media-sensation-ready story. Kristen Stewart also earns some compassion in a small role as Billy’s sister, but she’s also reduced to basic cipher. Lynn and the rest of his unit, Bravo Company, are brought back stateside for a publicity tour with an agent (Chris Tucker) who’s trying to sell movie rights. Over the course of a day at a pro football game in Dallas, Billy flashes back to his time in Iraq and the traumatic event that’s led to the P.R. whirlwind. The centerpiece of the day is the halftime show, in which the troops share the stage with Destiny’s Child – it’s 2004, by the way. And this may seem like a small thing, but it feels very odd for the film to use the name of an actual group and its members, only showing the actresses playing them from behind or obscuring them from view. This is in addition to the obviously fake approximation of the Dallas Cowboys organization, operating in an obviously-way-too-small stadium with logos and uniforms that are just off from the real thing. If it’s all part of a grand plan to satirize the spectacle, it doesn’t work; it just adds to the dishonest sensations of the proceedings. Steve Martin isn’t done any favors with a broad sketch of Jerry Jones as the team’s owner and he makes things worse with a sedate performance that treats every clichéd word as deeply meaningful. Working a little better is Billy’s quick romance with a cheerleader (Makenzie Leigh). It’s a rare instance of Jean-Cristophe Castelli’s script, based on the book by Ben Fountain, using one of its strained devices to show measurable impact on the main character’s psyche. Back in Iraq, the battle scene (yes, one scene) is generic, as are Billy’s fellow soldiers. 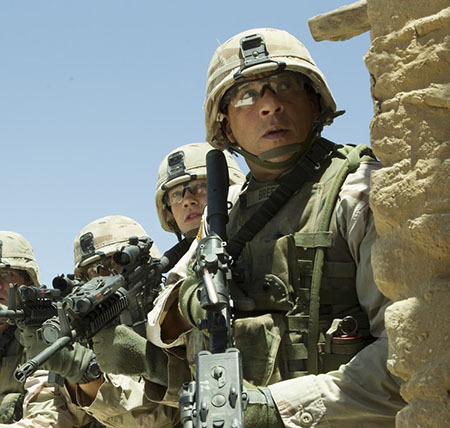 Garrett Hedlund steals scenes with his sergeant’s sternness, using it for opinionated rants and severe humor. The rest of the platoon is a predictable mix of ethnicities and attitudes. One awkward exception is Shroom (Vin Diesel), a camouflaged Svengali of sorts, nurturing young Billy with the use of Western bromides and Hindu wisdom. We don’t learn, or feel, anything. Without the flashy sheen of Lee’s intended vision, Billy Lynn’s look is stale. There are instances with obvious depth of field ready-made for 3D to pop and extreme close-ups that, without the enhanced resolution, feel like bland televisual techniques. The few minutes of the halftime show are well-done, with tracking shots through the chaotic production whizzing past dancers, pyro, and other production elements that trigger genuine-looking, and feeling – thanks to Alwyn, PTSD. 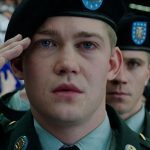 The momentary flashes of authenticity can’t save the film from its disingenuous slushiness, however, and Billy Lynn’s Long Halftime Walk feels like it’s been sanitized for our protection from real thrills or actual empathy.